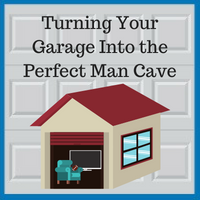 It is hard to get creative with a cluttered garage. Take a weekend to sort through the mess. Discard any unnecessary items. Consider selling items on eBay or in a garage sale to raise funds for redecorating your new space. Anything that remains should have a specific location in a cabinet, on a shelf, or otherwise out of the way. What do you want your man cave to become? Will it primarily be a hangout spot for poker games and football parties, or will it be more of an office and relaxation location? Visualize a realistic look for your area while also taking into consideration the available space. If you are going to spend any amount of time in your space, you do not want it to be too hot or too cold. If the temperature is not right, you will limit the usage of your man cave to fair-weather days. Soon, your space will become used as a storage shed once more. Take the time to insulate the floors, walls, ceiling, and garage door to maintain a comfortable climate. Do you have a pool table, a jukebox, or a television that you enjoy? Use it as your inspiration and focal point for the room. Now that you have your blank space prepared, paint the walls in an inviting tone and coat the floor in an easy-to-clean material. Add in sofas and chairs for ample comfort. Consider incorporating a bar area with a fridge to reduce trips in and out of the main home. Finally, add in the details such as decorative lighting, signage, and memorabilia. If you would like to use your garage space as a man cave but do not have the square footage or the storage solutions to make it happen, Blue Sky Builders can design a garage to bring your vision to life. We have over 39 years of experience building ideal garage and providing unique storage solutions in Chicago and DuPage County. Contact us today or call 630-852-8485 to find out how we can help you get the most use out of your space.